All the questions about being up in a series and unable to finish, all the doubt through out the year that a defensive system wouldn't suit this team, all the concerns about Ovechkin's low numbers in the regular season, all seemed to be answered for the Washington Capitals in the first series of the Stanley Cup Playoffs. 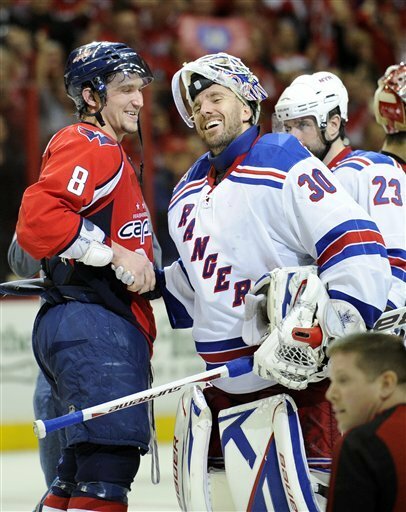 The Capitals make good on what they started with and do away with the New York Rangers in five games by beating them 3-1. "We've never done it before," Caps bench boss Bruce Boudreau siad of the series win only taking 5 games. "It is one of those things where I'll have to give my head a shake tomorrow morning and wonder where we're supposed to be playing." For the Caps to win the series they would need their big guns to score and did they ever show up in game five. Mike Green scored the first goal of the game on a powerplay tally in the first. Alex Ovechkin scored a beauty on a break away in the second period. Alex Semin finished off a pretty two on one with Marcus Johansson's perfect feed. For the first time in the series, a team has scored in the first period. Bryan McCabe took a tripping call over five minutes into the game. The Caps didn't waste much time crashing the net and pressuring for the game's first goal. After some point shots were pushed were pushed aside, the puck squirted out toward Ovechkin who faked the shot and passed it to Green. Green's one timer was saved by Henrik Lundqvist, but the rebound came back to him and he skated around the outstretched pad of the Ranger net minder and slipped into the net. The Rangers took exception to some Caps in the crease. Brandon Dubinsky, Chris Drury, Brooks Laich and Semin would all sit for roughing at the time of the goal. The Rangers got a extra bench minor for abuse of an official which was served by Vinny Prospal. It would lay the ground work for a very physical and chippy game as the Rangers looked like the only retribution they could come up with was needless hits and a few cheap shots. The first period wouldn't end with out Mike Green taking a slap shot to the head. You can actually see the screws from his helmet fly off as he laid down to block the shot. It would take quite a bit of time for him to return to the bench and when he did, he did not see any ice time. He is listed day to day with an upper body injury. "He's okay," Boudreau said. "We could have played him. The longer it went, we kept saying let's see if we can get by." With the Caps in the lead, the Rangers had to take some chances with the puck and it gave the Caps some opportunities at the other end of the ice. Bruce Boudreau masterfully timed his lines to tire out Marc Staal and Dan Girardi, the defensive pair in charge of defending the Caps top line of Nick Backstrom, Ovechkin and Laich. it would lead to the second period goal when Staal was forced to come back onto the ice after a quick rest because the Caps' top line were on. The following play saw the Caps thwart a Ranger advance and Washington made good use of the quick transition. Scott Hannan, helping to get the play up ice passed it to Ovechkin streaking down the right side. A tired Staal tried to keep pace but Ovi blew by him and a simple forehand to the backhand found the back of the net behind a sprawling Lundqvist. Ovechkin's goal sent the Verizon Center faithful in to a frenzy who broke out in chants of "We are louder!" With the Caps up two goals into the third period, the Rangers had no choice but to take chances to try and get back into the game. But Michal Neuvirth stood tall. He turned away 26 shots including some Ranger power play opportunities that looked like goals. The Caps were able to take advantage of the Ranger defense pinching in when Marco Sturm just chipped it pass Girardi and sent rookie Johansson and Semin on a two on one down the ice. Johansson made a nice saucer pass to Semin breaking in, and Semin shot it top shelf to give the Caps a 3-0 lead with 3:38 to play in the game. Even Boudreau had to celebrate a little after that goal. The Rangers were in all out desperation mode at that point and they did end up scoring with :32 seconds left. But when John Erskine threw an elbow at Ruslan Fedotenko the pair got into a wrestling match. Erskine was going to draw the extra minor except McCabe flew in at Erskine and Avery just got thrown out on principle. Both McCabe and Avery were given ten minute misconducts and along with Erskine and Fedotenko each took roughing minors that ended the game for them. The Capitals shake some playoff voodoo with a game 5 win. After 4 straight game sevens, it would only take 5 games for the Capitals this time around. "I think we learned our lesson," center Backstrom told reporters after the game. "That's what we've been talking about. People were so disappointed with last year, this is only the first round. We have higher goals than this. It is fun tonight, but tomorrow we have to regroup and think about round two." They will have to wait for the other series to end to find out their next opponent, but they will not face Philly or Boston if they win their respective playoff series. Mike Knuble did not play the final two games of the series with an undisclosed injury. He joins Dennis Wideman and Tom Poti who have been shelved because of injuries. The rest of closing out the series might give them time to make a return in the next playoff series. In this series, the home team has won four of the five games. A trend not mirrored by the rest of the league in which the visiting team has won 22 of the first 37 games in this year's playoffs. The Charlotte Checkers have put the Hershey Bears on the ropes with a win last night to take the series to 3-2 before it heads back to Hershey for the final two games. Former Cap prospect Oskar Osala scored the game tying goal before the Checkers rallied to beat the Bears 5-3.